CK Gas Products are pleased to be able to offer the full range of CIL’s neonatal screening kits and individual standards. With rapid shipping and fixed prices we can ensure that your institution will be fully supplied at all times. 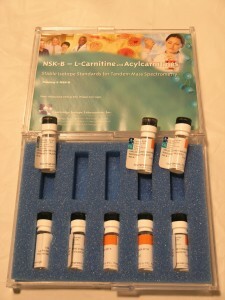 This tried and tested product is employed all around the world in neonatal screening labs with its high reputation for the accuracy and consistency common to all CIL products. Following the success of the popular NSK-B kit, CIL has recently introduced a kit of 4 additional standards to augment the range of testing possible with the NSK-B. Another recent addition to the suite of CIL neonatal screening products is the new NSK-T kit of succinylacetone standards. Having recently gained popularity as an additional tyrosinemia screening procedure, CIL have brought this new kit to market to enable rapid accurate use of this method to be incorporated into any current screening lab setup.